Minimum group size is 20 persons or 10 rooms. Check in: 2 p.m., check out: 12.00 noon. Late check out (12:00 noon - 6 p.m.) is 50% of one overnight, (after 6 p.m.) 100% of one overnight. Extra bed is given for additional payment. 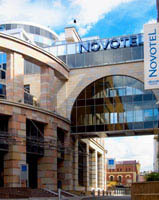 Novotel St. Petersburg Centre introduces seven modern meeting rooms with air-conditioning, daylight, ergonomic furniture and state of the art conference technology. Warm, contemporary, comfortable - a place where you will like working! Hotel's meeting rooms are from 25 to 100 square meters. There are two modular rooms providing space for up to 90 persons each. Business Center located in front of the meeting rooms provides easy and quick access to copy machine, fax machine, scanner, printer and computer stations.